I have been using BetaZyme by Nutritional Frontiers since 2 years now. It absolutely is a blessing. I would highly recommend it. 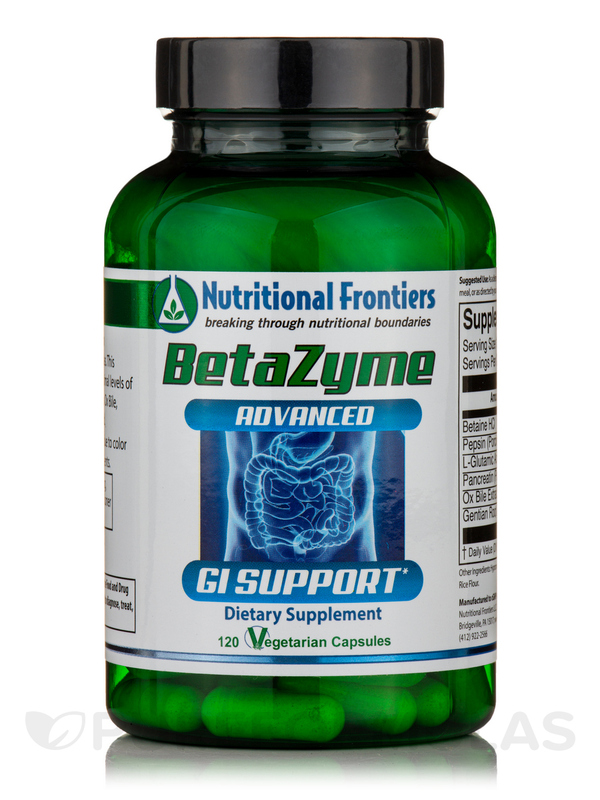 If you are looking to improve your digestive tract function or you have been experiencing difficulties with nutrient absorption‚ BetaZyme by Nutritional Frontiers may be able to help with your symptoms. BetaZyme combines a unique blend of ingredients that can possibly assist you with your digestive health—especially stomach acid. Excessive stomach acid can cause you to experience gas‚ indigestion‚ acid reflux‚ and heartburn. Because these can create discomfort in any individual‚ you want something that may be able to give you relief. 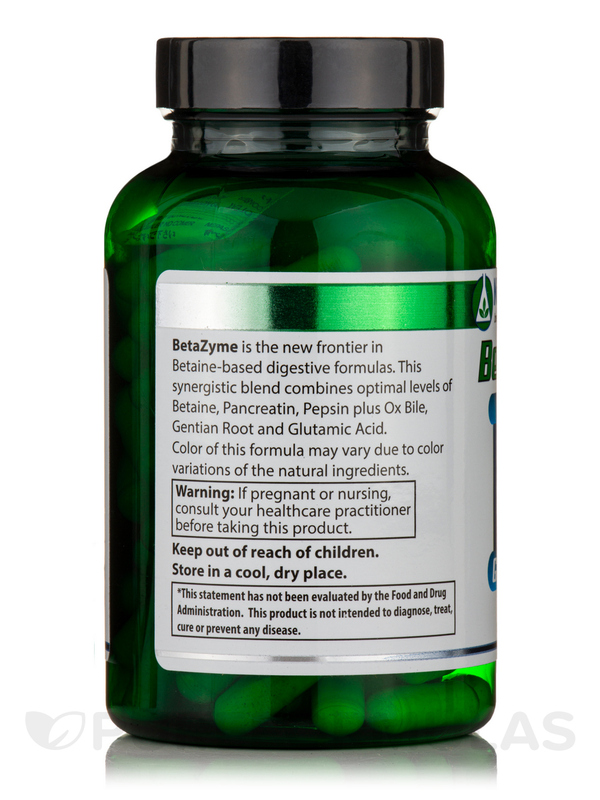 Some of the beneficial components in Nutritional Frontiers’ BetaZyme are: pepsin‚ ox bile‚ and pancreatin. Pepsin‚ an enzyme produced in the stomach‚ can help you digest proteins from meat and dairy. Ox bile is expelled by the liver and stored in the gallbladder. This can assist the body in digesting fats. 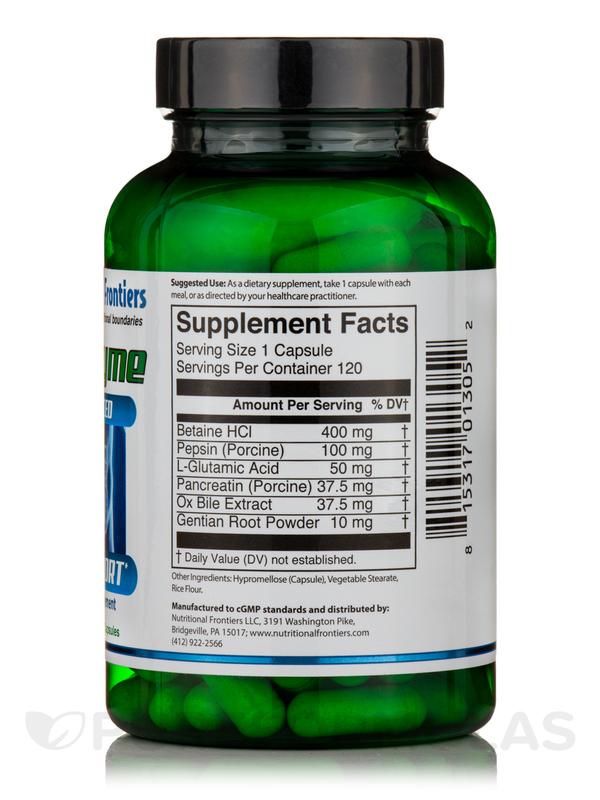 Pancreatin is obtained by the pancreas and it may help with intestinal gas and proper digestion. Please consult with your physician before taking BetaZyme by Nutritional Frontiers. When first using BetaZyme please be sure to follow the directions carefully. Always take BetaZyme at the start of the meal‚ if taken without food‚ sensation of stomach burning may result. 1. At the very start of the meal‚ take one capsule of BetaZyme and monitor how your stomach feels during and after eating. Should any burning or heaviness occur‚ or if burning has been present previously and is nowworsened with the use of the BetaZyme‚ discontinue. This is an indication that your stomach lining may be damaged and you should use Power Cleanse and Lean Greens by Nutritional Frontiers. 2. If the first dose of BetaZyme produced no noticeable stomach discomfort‚ try taking two capsules at the start of your next meal‚ again monitor for burning and or heaviness during and after eating. If taking two capsules produces some discomfort‚ but one capsule does not‚ restrict yourself to one capsule at the start of each meal. If the two capsule dose produces no discomfort‚ try three capsules at the start of your next meal. 3. If all goes well when taking three capsules at the start of each meal‚ stay with that dosage‚ most individuals will not require increasing the dosage to four capsules. Regular use of BetaZyme will in most cases “re-train” the stomach to produce higher concentrations of acid on its own. This process may take anywhere from several weeks to several months‚ depending on the individual. The most significant indication that acid production is improving is that BetaZyme can no longer be comfortably tolerated. 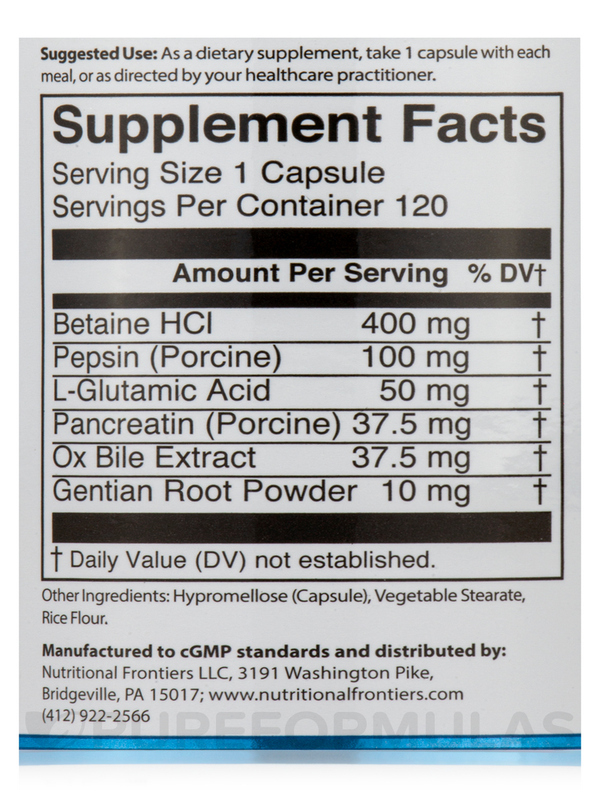 BetaZyme by Nutritional Fronteirs is a good product to support liver function. Always looking pregnant because of constant gastric bloating and distension due to gastroporesis is no fun! After trying other products to relieve these symptoms, I visited a naturopath who recommended BetaZyme by Nutritional Frontiers, and I almost instantly began to get relief! It's been a life saver! Works quickly to relieve symptoms. I wanted a digestive supplement with Bile and Betaine HCL. 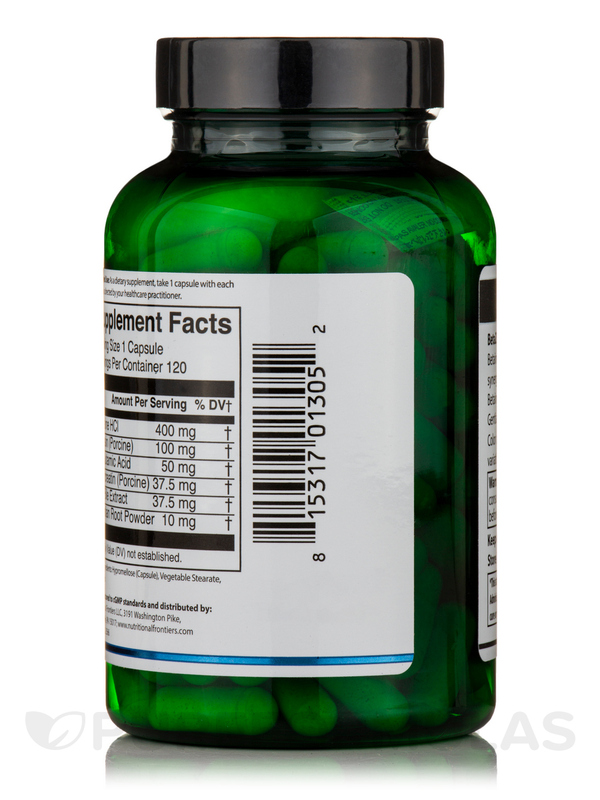 BetaZyme by Nutritional Frontiers is one of the few that combines both ingredients. I also like the concept of the Gentian Root and its purpose. BetaZyme must work because I have seen a difference in my digestion with the BetaZyme. I have taken BetaZyme for quite a while and continue to reorder -- I would highly recommend it. This has been very effective. I've never had any ill effects from taking this - even when I have had a big meal and decided to take an additional capsule after the meal. Dr prescribed BetaZyme to help heal my gut. No unpleasant side effects or unpleasant taste.